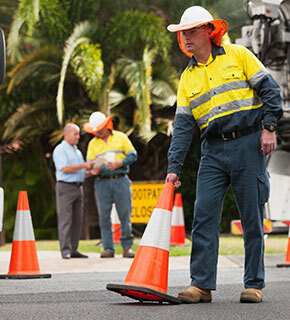 This type of connection can be undertaken as a staged water connection and should be used when connecting new infrastructure to the existing network. We encourage you to engage an Endorsed Consultant who can design and certify the connection, as well as manage the application and construction process. Once you have gathered all information listed above, you can apply through the Development Applications Portal. The portal will guide you through the steps for making your application. Once your application fees have been paid, our team will assess your application. Next steps in the connection process. A decision notice will be issued 20 business days upon receipt of a properly made application. For more information refer to our service commitments (PDF). We undertake assessments of plumbing and hydraulic systems to ensure they are constructed in a manner that protects our water and sewerage infrastructure. These assessments are undertaken in accordance with the Plumbing and Drainage Act 2002 and integrated into our Water Approval Process. As part of this process, you will receive a Water Approval Decision Notice, which you can submit as a requirement of your application to council. To gain a Water Approval Decision Notice, apply for a Property Service Connection via the Development Applications Portal. You also have the flexibility to schedule your application for a Water Approval before, during or after council’s development assessment process. If you have already received a “Certificate to Connect” from us under our previous system you can still provide that to councils for your plumbing approval. In accordance with the Plumbing and Drainage Act 2002, Queensland Urban Utilities has a written agreement with our shareholder councils for residential dwellings (Class 1a & 10a) and for Class 2 – 9 buildings where a Water Approval Decision Notice has been issued. You do not need to approach us for written approval in these circumstances.